A new generation of of table tennis players are set to step on to the world stage in Suva next month. 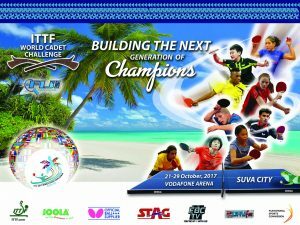 There’s just four weeks to go until Suva welcomes the world to its shores for the 2017 ITTF World Cadet Challenge. It is the second time that the Oceania region will host the event, after the tournament was staged in Guam five years ago. As the capital of Fiji, Suva is shaping up to be a special host for globe’s best table tennis teens. More than three hundred islands, with only a third of them inhabited, make up the nation, so athletes can expect a lot of sand, sun, as well as table tennis. The event could also be well on the way to breaking a Fiji sport’s record. With players, managers, and technical officials from over forty countries attending, it looks like being the most diverse sporting event to take place in Fiji’s history. The city is well prepared to meet the demands, with the Vodafone Arena, which seats more than 2000 spectators, the venue for the event. Suva is ready to welcome the next generation of champions.